The story here follows the plot of the film fairly closely, as Shrek the Ogre goes on an unlikely quest to rescue a princess and discover his true sense of worth, with a few extra elements (such as more backstory for Shrek and Princess Fiona) added to expand the story. I found the film pleasantly surprising and endearingly complex, but the musical kind of flattens the story out and has something of a “by-the-numbers” feel, and seems at least 20 minutes too long. Still, there were some great moments and some very good songs. First, I will say that this production had a lot of good things going for it, most notably the fine cast. Stephen Wallem brings a lot of warmth to Shrek, and seems better with the serious moments of the show (such as the songs “When Words Fail” and “Build a Wall) than the comedic ones, although his comic skills are fine as well. He plays particularly well against Michael James Scott as Shrek’s unwelcome (at first) traveling companion Donkey, and Julia Murney as the disillusioned but stubbornly optimistic Princess Fiona. Scott in particular gives an impressive comic performance. The real stand-outs in this cast, however, are Rob McClure as the diminutive villain Lord Farquaad, who steals every scene he is in and impresses with the sheer physicality of his performance, and Natalie Venetia Belcon as the voice of the Dragon, displaying a powerful voice and lots of infectious attitude in the song “Forever” with Scott and a group of captured knights. This, to my mind, is the best scene in the whole show, with lots of spectacle and impressive performances all around. Other highlights of this production included all the ensemble numbers in Farquaad’s Castle (“What’s Up, Duloc” is a gem), and the “dare to be different” anthem “Freak Flag”, sung by the outcast Fairy Tale characters. Murney as Fiona had some good moments with “I Know It’s Today” (sung as a trio with Maria Knasel and Allsion Broadhurst as two younger versions of the Princess) and “Morning Person”. The finale and curtain call performance of “I’m a Believer” were also a lot of fun. Technically, I found the production to be uneven. There were quite a few noticeable issues with the sound, with audible crackling of microphones and inadequate amplification in places. The costumes were very basic and had an amateurish feel, especially in terms of Shrek (his headpiece even came off at one point in the show) and the Fairy Tale characters. I thought Lord Farquaad’s costume was well done, though, and the colorful larger-than-life Dragon puppet was very impressive. The sets, designed by Steve Giliam, filled out the large Muny stage well, and I thought the electronic scenery wall was put to excellent use in setting the atmosphere, particularly in Shrek’s swamp and on his journey with Donkey and Fiona back to Farquaad’s castle. I have one issue in regard to the audience and I realize this will be a bit of a rant, but it’s a very big deal to me. I think it is extremely rude to the actors onstage and the rest of the audience when large groups of people get up to leave during the finale. OK, so some people may have to drive a long way to get home, but if you come to a show, is it really too much of a hardship to stay for the whole performance? Do people even realize that the actors can see them? I don’t see this at the Muny every performance, but I’ve seen it a few times before and it always bothers me. I would advise people to think about whether they are able to stay for the whole performance and if they can’t, maybe they should just stay home. There is a page about “Theatre Etiquette” in every Muny program, but I wonder how many people actually read it. OK, rant over. 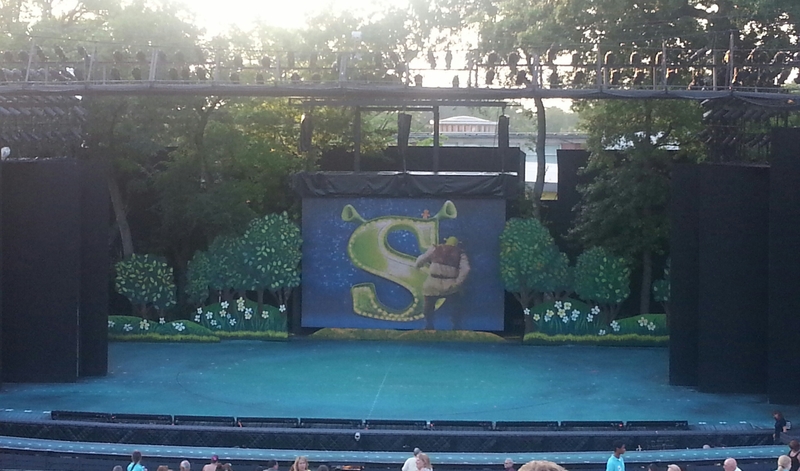 For the most part, I would say Shrek at the Muny is an entertaining performance of a somewhat underwhelming show that doesn’t quite live up to its source material. It’s an enjoyable evening with some excellent moments and good performances, but knowing what the Muny is capable of, I do find myself wishing it had been better.